Blog - Minoko Nail Studio - Best Nail Salon in Vancouver Area: All NEW CLUB MEMBERSHIP! @ Minoko Nail Studio, we believe you should get your manicure/pedicure done regularly so you will always feel more healthy and attractive. We've designed our membership program to fill that need. 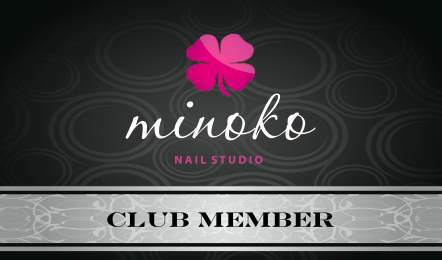 Introducing the all new Minoko Club Membership! It’s free!! Come in for a service and you will automatically qualify for one of our club membership. Below are the 4 memberships we currently offer. But you must hurry, membership spots are limited, so get yours now since they'll run out with the Christmas season! For a limited time only, we are also offering a special VIP CLUB membership! We proud to offer a truly revolutionary new concept in nail club membership! Let your imagination run wild with our VIP club! With our VIP membership, you can have any service you desire with absolutely no limits or restriction. If you are used to spending hundreds of dollars at nail salons then this is for you! Have Manicure every day? Sure! Get a new set of nails covered with Swarovski crystals? No problem! You can easily have $1000 worth of service at our salon for free under the VIP CLUB. You must hurry, since we have very limited number of spots available. Feel free to call us at 604-725-6829 for more details, terms, and conditions.